Council Amalgamations – What now for constitutional recognition of local government? Posted June 16, 2016 by Christopher Harris & filed under City News. The question of whether to recognise local government in the constitution was last put to the Australian people 28 years ago, in a referendum brought by Labor Attorney General Lionel Bowen. The overwhelming majority voted ‘no’. At the time the campaign against the changes argued that the recognition would be an intrusion by the federal government into state and local government matters. However with the Baird Government’s controversial forced council amalgamations, the issue of local government has become a significant political issue. 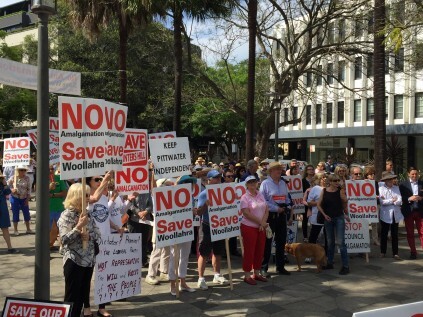 The amalgamations have found opposition even in some of the Coalition’s traditional supporters, such as Toni Zeltzer, the Liberal Mayor of Woollahra. In emphasising their opposition to the amalgamations, both Labor and the Greens have reiterated their support for constitutional recognition of local government. A referendum was planned to be held under the government of Julia Gillard but was pushed back when Kevin Rudd returned to the leadership and then called off by Tony Abbott after his election. This creates a bleak political reality for the future of the proposal, at least in the short to medium term. The requirement that a referendum for constitutional change receive a double majority of the voters nationally and of the states effectively necessitates a bipartisan approach. Professor George Williams of the Gilbert and Tobin Centre for Public Law at UNSW says that local government should be represented in the Australian constitution. “That local councils should be mentioned in the Australian Constitution as our third arm of government. This should also provide a means by which the Commonwealth can fund local government activities,” Prof Williams said. The purpose of constitutional recognition of local government was never about stopping Baird’s unpopular changes but about acknowledging councils as a third tier of government, and ensuring that the Commonwealth could directly provide councils with funding. Despite this, it could raise headaches for the Coalition, and they will likely attempt to keep the matter stalled. At this stage, constitutional recognition of local government shares some similarities with the debate around an Australian republic. Whilst supporters regard it as almost an inevitable outcome, the path towards achieving it remains unclear. Prof Williams said that although he supports constitutional recognition for the local councils, he stopped short of saying that the Constitution should not be in a position to prevent amalgamations of the kind we are seeing in NSW. “I do not believe that the Constitution should prevent amalgamations of this kind. Such matters should be left to state legislation,” Prof Williams said.